This speaker derives it’s power from a powerful 7 amp hour rechargeable battery that can be charged by the mains plug supplied. The speakers are contained in a robust housing with reinforcing bars for added protection, making it ideal for outdoor entertainment. 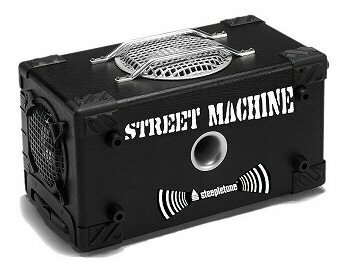 What's more, the Street Machine has additional inputs for a microphone (should you wish to make a speech (or sing a song! ), and an additional input allowing you to connect other devices, such as a CD player, making this a very versatile product. The unit is easily transportable - it can either be carried, or wheeled around using its retractable trolley handle.